The Reed Scriptorium is in session. Twenty-eight years after it was removed from the curriculum, calligraphy is back at Reed in the form of the Calligraphy Initiative, thanks to Cooley Gallery Director Stephanie Snyder '91. Stephanie came to realize how central calligraphy was to Reed's living history when she curated Lloyd Reynolds: A Life of Forms in Art at the Cooley Gallery during last year's Centennial Reunion. Former students of Lloyd Reynolds [art 1929-69] encouraged her to find a way to return calligraphy to campus. In the 1980s, when calligraphy lost its accreditation, there was no Cooley Gallery, Educational Outreach Initiative, or independent department on campus that could steward such an activity. Stephanie realized it was possible to brink back the discipline without making it part of the academic program. "We wanted to go back to the original vision of how calligraphy started here as a community endeavor," she says. 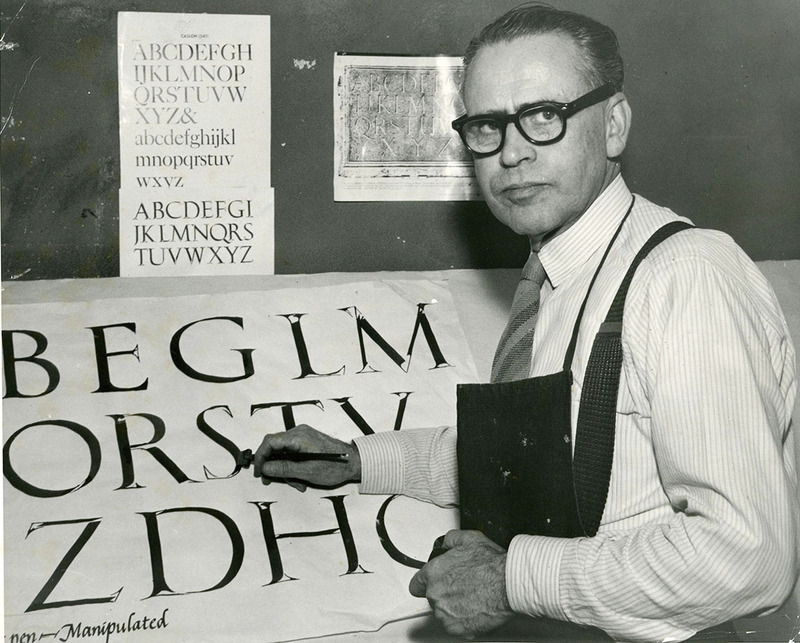 "When Lloyd started learning calligraphy, he would teach anyone who was interested." Though it is named in honor of the charismatic man of letters, the Calligraphy Initiative is not focused on Reynolds's mystique. Its three-pronged approach begins with a weekly Scriptorium, where students, faculty, alumni and staff come together every week to practice their hand. On alternate weeks they receive either formal instruction by Inga Dubay, a former student of Reynolds, or historical overviews about calligraphy by Outreach Coordinator Gregory MacNaughton '89. As part of the Open Gallery outreach program, Gregory also coordinates a group of K-12 teachers who come to the gallery every month to collaborate on lesson plans they can take back to the classroom on paleography, the alphabet and teaching calligraphy as an art practice. The Initiative will also conduct workshop-based, non-credit calligraphy instruction that might, upon the request of faculty, support instruction in courses offered in the religion and art departments. Kambiz GhaneaBassiri [religion 2002-] and Stephanie are working on an exhibition of Arabic calligraphy for 2014 to coincide with a residency by Persian calligraphy scholar Hamid Reza Ghelichkhani funded by the Cooley Gallery and the Calligraphy Initiative. "Sometimes walking, like handwriting, is more efficient and practical," he says. "When we take a walk beside a dear friend, or down a trail into the wilderness, it takes on a significance that transcends transportation and takes us places that we can't go in the car. The same is true of beautiful writing." Thanks to a generous donation from Jonathan Mark Snyder '91, the initiative has been funded for the first few years. Jonathan is a Senior Manager at Adobe Systems, Inc. (where a number of Lloyd's students shaped the company's typography program) and his father David Snyder '65 studied with Lloyd Reynolds at Reed.